Prohibition history: How the ban on booze produced the modern American right. 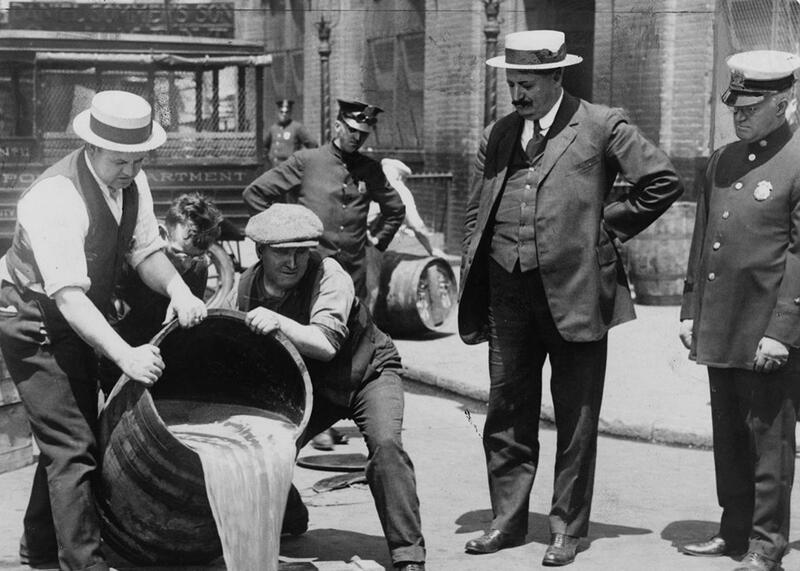 New York City Deputy Police Commissioner John A. Leach, right, watches agents pour liquor into the sewer following a raid during the height of Prohibition. The period between 1920 and 1933 lives on in our collective memory as a misguided experiment in social control, colorfully defied by flappers, artists, and F. Scott Fitzgerald. But historian Lisa McGirr argues in her new book The War on Alcohol: Prohibition and the Rise of the American State that Prohibition was anything but a historical outlier. The period, she writes, should be regarded as crucial to the development of law enforcement, the penal system, and the grassroots American right wing. Prohibition, McGirr argues, carried within it the germ of a now-familiar kind of federal government: “a state that has been interventionist yet weak, heavy on coercion yet light on social welfare.” And in describing the toll the Prohibition years took on marginalized communities, McGirr uncovers a new vision of a Jazz Age that was anything but fun. I spoke with McGirr about her research recently. This interview has been edited and condensed for clarity. You recount evidence of uneven, unfair enforcement of Prohibition laws that I think some people might find surprising. What kinds of evidence did you find that this kind of selective enforcement went on? By and large the stories that we have about Prohibition have emphasized failure. Endless flows of bootleg gin and speak-easies, the flouting of the law. [It’s true] that there was flawed enforcement, there was selective enforcement, but there was very, very real enforcement. And once you start to look both at the national level but also at the state level [you see that] policing took on a role in enforcing the law in particular against groups that were already identified with criminality: poor people, immigrants, African Americans. I was trying to get beyond a familiar cast of characters and the familiar group of folks that we know [in order] to look at what the law meant for ordinary men and women. One way is to look at enforcement—at policing records and state enforcement records. There’s evidence at that ground level, looking at evidence of individuals who were policed and targeted; there’s court records, there are also simply prison statistics and numbers, where you can see in places like North Carolina, Virginia, and Texas that you have an escalation in rising prison numbers during the Prohibition era. You see a real first spike in prison growth both at the federal and the state level, largely [because of] prohibition enforcement and the collateral violence and crime it sparked. What was it like for people living with these new laws? How did everyday life change? Let me first talk about how life changed for urban, ethnic immigrant workers in a place like Chicago. This is a place that is widely considered a largely wet town and wide open in terms of enforcement, where you think of enforcement as kind of a joke. But there were huge ramifications of the law, nonetheless, in these immigrant ethnic communities. First, the law was very much seen, and rightly so, as a sort of direct attack on the cultural values of these communities. Drinking had been part of the rhythms of daily life. So [the law] was seen as a form of hostility by these groups. There’s this feeling like “Wow. Our whole way of life is under attack.” But second, along with that there are the realities of how life changes on the ground. So one is you have the shuttering of saloons. The open ways of drinking that had forged communities in these spaces are pretty much gone. I did a lot of work in settlement house records to trace the way neighborhoods changed. The way drinking became increasingly hidden, moved indoors, moved into homes, moved into shuttered spaces with whitewashed windows to hide what’s going on inside. Drink continued, but in different ways, in hidden ways. Drink was far more expensive. So it was also kind of a budgetary concern for working-class folks. But of course there was new violence in their neighborhoods because police encouraged drink suppliers to move into new areas where they would be less seen. And that’s usually in poor communities that didn’t have power to keep them out. And so there are new levels of violence in these neighborhoods as well. You look at men and women who were trying to work with these communities in settlement houses, you see them talking very much about these terrible ramifications of the law in their communities. These are very real grievances. They’re not grievances that have been widely understood, because nobody really tried to look at and get at the lived experiences of these men and women under the law during this period. One of the things that really surprised me in the book was the level of citizen enforcement you found going on—maybe especially in rural areas, less so in a city like Chicago. Prohibition forced federal and state governments into an increased role of policing and surveillance. But of course even though it was a radically ambitious law and it was a qualitatively new thing, the law was so ambitious there was no way to rein in the kind of violations that were taking place. And of course that led to a crisis of law observance. By 1923, Warren Harding declared this crisis to be a national scandal. As a result, all of the men and women [in the temperance movement] that had fought so hard, and for so many years to achieve what they saw as a great triumph, were deeply concerned about this lack of observance. This is a period, coming out of WWI, where the repercussions of the war had led to all sorts of radical labor insurgency, and there was a new militance in African American communities; the war had led to changes in gender roles. So many of these Protestant evangelical men and women were already anxious over a whole host of other social changes that had occurred coming out of the war. When Prohibition passed, violations of the law basically came to represent in a very concrete form all of the anxieties over the other social changes. The organizations that had been fighting for years to pass the 18th Amendment—the Woman’s Christian Temperance Union, which was one of the largest women’s organizations in the country and the Anti-Saloon League, which called itself Protestant Church in Action Against the Saloon—after 1920, they didn’t just disappear or go back home! Well, some did, but many saw that their task was to see that this law, which is part of the Constitution, is actually enforced. So they began to campaign for law enforcement. Right. So the resurgence of the Klan spiked [to] between 2–5 million [total] members between about 1920 and 1925. And it is no coincidence that that spark, that snowball effect of the Klan spiraled in the wake of the Volstead Act. In going across these different communities and looking at how the Klan recruited, what were some of the central concerns around which it was able to build its chapters, I saw it was often around the issue of the lack of observance of Prohibition, the issue of bootlegging, of cleaning up communities. [But] they weren’t just concerned about drink. This issue was used instrumentally as a mandate to target those groups they already saw as enemies of white Protestant nationalism: immigrants, Catholics, and African Americans. And Prohibition provided a means for them to justify what became in a way kind of an enforcement activity. Either by backing local police or stepping in where local police would not act, to enforce the law, but selectively. So they would essentially raid homes, target immigrant Catholics, raid for wine or sources of liquor. What did Klan enforcement look like in a local place? There was a series of raids that were held, and eventually by the end they were essentially burning down Italian-owned roadhouses, they were entering Italian immigrant Catholic homes and smashing down doors, throwing bottles of wine, planting evidence. Were these citizen enforcers actually bringing violators to court? Or was that not the point? Well, it was both. There were some who were actually arraigned and put in jail, but I think part of it was simply a campaign of terror— “ethnic cleansing” is too powerful or strong a word, but really a targeted campaign of terror against these communities. So it’s clearly not about enforcing the law. There are stories that are told of [KKK] folks who come into [immigrant] homes and not only smash their wine—they drink it themselves! So the Klan was not a temperance organization. Its mission was a white supremacist, anti-Catholic, anti-immigrant mission. Your first book, Suburban Warriors: The Origins of the New American Right, was about the growth of the American right wing during the ’60s. To what degree can you situate this weird set of bedfellows—the temperance organizations and the Klan—within a larger history of the right? Is this something that’s connected to the resurgence of conservatism later in the century? I see the citizen enforcement that’s unleashed [during Prohibition] as the first incarnation of the grassroots 20th-century right. In a very powerful way. It was Roy Haynes, the commissioner of Prohibition, who essentially declared that there were all sorts of threats to the nation, the threat of modernism, anti-American values, and he argued that anti-Americanism could be ratcheted out if citizens were vigilant in enforcing the Prohibition law. So Haynes really framed the argument about why citizens not only need to observe the law themselves but become vigilant in backing the law as a way of tamping down on all sorts of social change. His vision was very much a vision of white protestant Christian nationalism. And I think you can really see in some of Roy Haynes’ words a sense in which to these white Protestant evangelicals, Prohibition and the effort to enforce it became a means of trying to sustain a particular vision of the nation. But the difference is that the kind of vigilante levels of violence that you see in the 1920s, particularly with the KKK, does not appear again in the same way in the latter incarnations of the religious right. What about the connection with the war on drugs? The war on alcohol in the 1920s and the war on drugs of the ’70s and ’80s are symbiotic campaigns. The initial edifice of the war on drugs was built with similar logic, the same cast of characters, and some of the initial infrastructure that came out of the war on alcohol. One of the biggest differences between those two iterations of narcotics wars is that the state in the ’70s and ’80s is far more powerful bureaucratically. It’s far stronger. It functions in a more efficient manner. And [during the war on drugs], though the consequences have been even more egregious in terms of violence and numbers of folks who were behind bars because of drug violations, there’s been far more of a consensus around it and it’s been far less controversial because it’s the state who’s done the enforcement. So it’s been less visible. The KKK, the right of the 1920s, caused enormous controversy and social conflict on the ground level, and the Klan as a result quickly lost support. What are the major sorts of expansions of federal power that you connect to Prohibition? Which do you think are the most important? Prior to Prohibition the federal government was a bit player, a tiny player in crime control. The Bureau of Investigation had been founded in 1908, but its purview was small. And it’s with Prohibition that you get an exponentially greater birth of policing, but also as a result of some of the violence of the black markets during Prohibition, as a result of the damage of Prohibition, the lack of enforcement, crime itself becomes a sort of national obsession in the 1920s. And as a result again there’s this infrastructure that’s built because of this obsession and because of an effort to tamp down on crime. So this is a moment when you get the Uniform Crime Reports; it’s the moment when the Bureau of Prisons is reorganized and expanded; when the prison infrastructure also expanded; it’s the moment when J. Edgar Hoover’s Bureau of Investigation gained new purview and greater authority, in the 1930s; it’s under Herbert Hoover that you have the formation of the first Wickersham Commission, which is the federal government involving itself in criminal justice, essentially in order to professionalize and standardize it, to take on crime control at all levels. Why do you think we are prone to think of Prohibition in a nostalgic way? Why is it that we have so much affection for it? There’s a cartoonish quality to our memories of the time period. For a very small elite group of men and women, the law of Prohibition encouraged them to radically break from what they saw as a puritanical effort to crack down on their leisure. So for a very small group of avant-garde people in places like New York, who were more protected from the draconian arm of enforcement, who could afford to engage in the world of speak-easy culture, Prohibition fostered a kind of cultural rebellion. This is the world of the flapper dress, the radical embrace of new sexual norms, new music, that was really fostered in this underground world of leisure, a world that was no longer under the purview of state surveillance. So in this world that [historian] George Chauncey talks about there is an entirely new visibility for gay nightlife and gay culture, because it was possible in these new criminalized spaces; they weren’t under state respectability or didn’t have to follow state norms. So I think part of the reason we have this nostalgia for it is because you can see within it these forms of rebellion. We romanticize the meaning of engaging in these forms of leisure, which are secretive, which are adventurous. It’s not an inaccurate portrait; it’s simply a very, very partial portrait.